On 11 February, the 9th meeting of the Extended Leadership Council 9th meeting of the Extended Leadership Councilof SDSN Germany took place at the Wissenschaftszentrum Berlin für Sozialforschung. The topic of the session was “Sustainability in times of populism – answer or victim?”. The members of the Council discussed this highly topical issue with Nina Scheer (Vice-chairwoman of the PBNE), Johannes Dimroth (Federal Press Office), Edgar Grande (Center for Civil Society Research at the Wissenschaftszentrum Berlin für Sozialforschung), Hanna Schwander (Hertie School of Governance) and a couple of other guests. Following this session, SDSN Germany will be organising a workshop on the topic together with Adelphi, Engagement Global and Germanwatch in the next months. The successful opening event “New opportunities for growth and globalisation – sustainability as a European project for the future” of the jointly by HVGP, SWP and SDSN Germany organised series “A new departure for Europe – the SDG’s as both opportunity and challenge for German politics in Europe” took place on 18 February in Berlin. Besides numerous high level participants from science, the business sector and civil society, Katarina Barley (SPD top candidate for the European election) joined with a keynote. 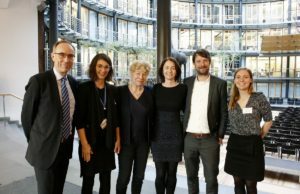 The second event of this series was held on 7 March in Berlin under the topic “Sustainability as a formula for social justice and coherence in Europe”. Here again, representatives of various societal and political milieus came together and were addressed by keynotes from Rita Schwarzelühr-Sutter (Parliamentary State Secretary at the BMU) and Svenja Hahn (Junge Liberale / FDP top candidate for the European Election). In order to include relevant personalities of the new elected European Parliament and Commission, more events of this series will take place in the aftermath of the European election in the second half of the year. For the first time, the European sections of SDSN came together on 11 and 12 March in Paris to discuss ways to jointly support the implementation of the SDGs on the European level as well as in the member states. The secretariat of SDSN Germany started to visit its members and partners on a ‘#SDSN_Deutschlandreise’ with an initial appointment at the Wuppertal Institute, in order to enhance the exchange within the network and to reveal new opportunities for cooperation.